The Hawaii Congresswoman was just 21 years old when she was elected. Hawaii Rep. Tulsi Gabbard, the first American Samoan and Hindu member of Congress, formally launched her campaign for president on Jan. 24. Gabbard, 37, who kicked off her campaign with an official announcement in Honolulu, Hawaii on Feb. 2 made her 2020 plans known in a video she posted to Twitter. Internally, Gabbard's campaign got off to a rocky start with her campaign manager reportedly leaving, according to Politico shortly after a campaign rally in her home state. Education: She earned a degree in international business from Hawaii Pacific University in 2009. What she does now: U.S. Representative for Hawaii’s 2nd congressional district since 2013 and she's a major in the Hawaii Army National Guard. What she used to do: She was a member of the Honolulu City Council from 2010-2012 and served on the staff of U.S. Sen. Daniel Akaka. She also served as a member of the Hawaii state House of Representatives from 2002-2004. Gabbard was just 21 when she was elected to the Hawaii State Legislature in 2002. She was the youngest person ever elected in the state. She was also the first state official to voluntarily step down from public office to serve in a war zone when she volunteered to deploy with her fellow soldiers in 2004 while in the Hawaii Army National Guard, according to her official website. In 2007, Gabbard graduated from the Accelerated Officer Candidate School at the Alabama Military Academy. She was the first woman to finish as the distinguished honor graduate in the academy's history, according to her website. In the same year, Gabbard was commissioned as a second lieutenant. (Bill Clark/CQ-Roll Call,Inc./Getty Images) Rep. Tulsi Gabbard walks to the House floor for a vote at the Capitol, Jan. 29, 2019, in Washington, DC. Gabbard is the first Hindu member of Congress. When she was elected to the House of Representatives in 2012, she was one of the first two female combat veterans to ever serve in the U.S. Congress. Gabbard served two tours of duty in the Middle East. She served as a specialist in a field medical unit with a 29th Support Battalion medical company during her 12-month deployment in Iraq in 2005. 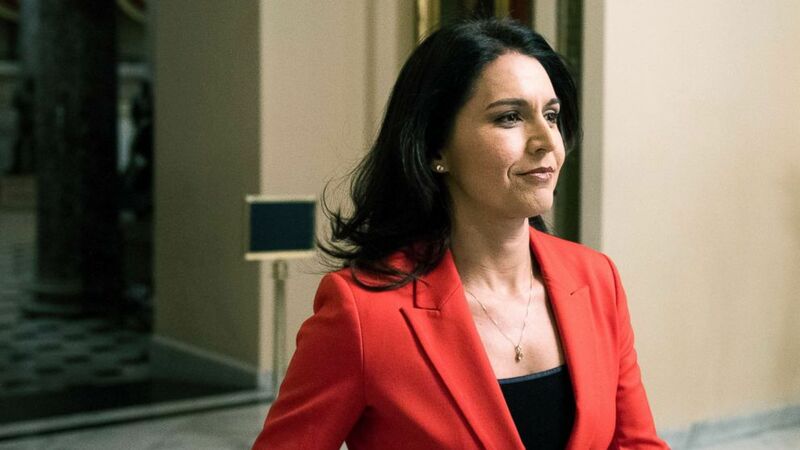 Gabbard was one of “the first women to set foot inside a Kuwait military facility” and “the first woman to ever be awarded and honored by the Kuwait National Guard for her work in their training and readiness program,” according to her official website. Also according to her website, Gabbard co-founded an environmental non-profit called Healthy Hawai’i Coalition, which focused on educating children about protecting Hawaii’s environment, when she was a teenager.